The perfume is housed in a round bottle that is characterstic of the Chance line and has a frosted glass stopper. 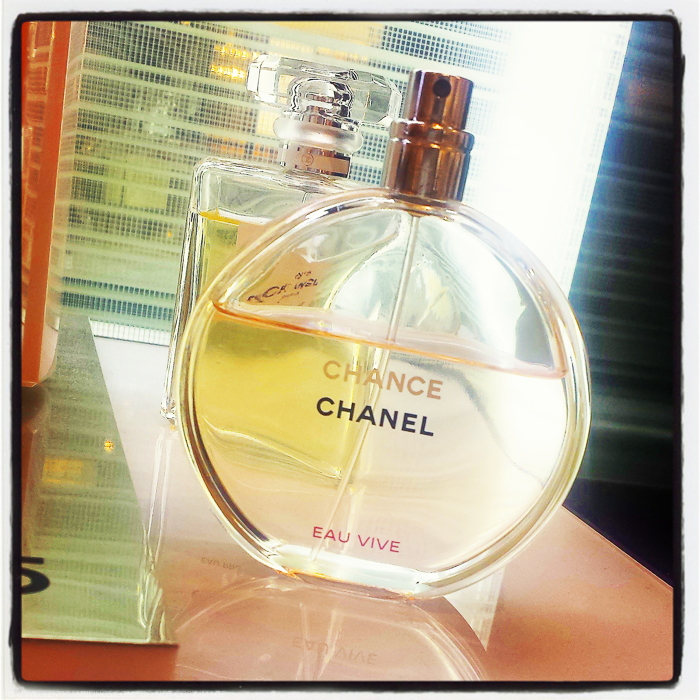 The fragrance notes in Chanel Chance Eau Vive include grapefruit, blood orange, jasmine, cedar, and iris. The perfume opens with a strong blast of the citrusy notes, and I can almost detect a bitterness hidden in there. Almost, but not quite there. Warm floral notes join in as the fragrance settles into the skin. The stronger citrus notes tone down in a few minutes, and the fragrance settles into a softer warm citrusy floral as it dries down with just a hint of sweetness and starts to resemble Chance Eau Fraiche over time. Chance Eau Vive seems like a perfect summer fragrance with fresh citrusy notes and a light floral heart. While not really identical, Chance Eau Vive reminds me of other popular summer fragrances, Marc Jacobs Daisy or Dolce and Gabbana Light, for instance. I love both those perfumes, but I do expect something a bit more unique when it comes to a Chanel perfume. Chanel Chance Eau Vive is a like, not love for me, but only because it doesn't seem to stand apart. It is the sort of perfume that gets you compliments, and with a fresh young vibe to it, this would be a lovely perfume to wear during the spring/summer season. If you have found other Chanel perfumes a little too "grown-up," then Chance Eau Vive just might be the one for you (as would Chance Eau Fraiche).